Full listings on "live" page. Over the last three decades Lanarkshire based singer/songwriter John Hinshelwood’s finely crafted, country tinged songs have firmly established his reputation as a writer and performer of distinction. He has recorded with, among others, ex Byrd Gene Parsons, legendary Scottish songwriter Rab Noakes, American singer/songwriter Kathy Stewart, and ex Poozie Patsy Seddon, as well as sharing a stage with many distinguished artistes including Roger McGuinn, Tim O’Brien, Dave Pegg, and Martin Simpson. 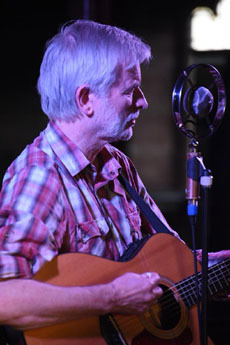 His live appearances have included Celtic Connections, Highland Festival, Wembley Country Festival, Perth’s Southern Fried Festival, Hawick Americana Festival, and Summertyne Festival in Newcastle, in addition to headlining at most of the main acoustic music clubs in Scotland and many other venues across the folk/country/Americana music scene. His CDs ‘Holler til Dawn’, ‘Shattered Pleasures’( a collaboration with Canadian singer Sandra Gellatly), and ‘Lowering the Tone’ have all received widespread critical acclaim, with the prestigious publication Maverick describing the latter as ‘ a superb album full of beautifully crafted songs’. A track from the CD, ‘What’s Left is what’s Right’, reached number 4 in the British/Irish Independent Country music chart.